Hunting the web for a SEO for Dummies guide? If you answered yes, that particular quest ends right here, right now. Let me warn you though, it’ll be an extremely basic guide, SEO for Dummies, SEO from scratch that’s what I’m sharing over here, the stepping-stones and not the elevator so it’s best suited for those who are new to the SEO game. SEO for Dummies 2019: What is Search Engine Optimization? How to easily built backlinks? 1). Use the primary keyword in the Headline! According to Wikipedia, SEO means it “ is the process of affecting the online visibility of a website”. In simpler words, it’s the process of optimizing and tweaking your site such that it appears above other sites when searched for a keyword. Why do you need to fine-tune your site for better visibility? There are over 1 billion websites on the planet, and nearly every possible keyword which you can imagine, has a site on it, or an article in the least! Therefore, whenever a user searches for a keyword, millions of results pop up. 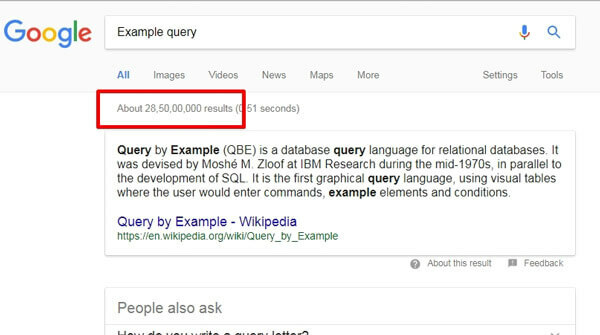 And, as you might have experienced for yourself, users seldom go to Page 2 of Google, because the first 10 results most often then not, solve the query. So, in order to beat the competition, and make your site appear in the top 10 results is why you need SEO. As I mentioned in the earlier sections, this is a SEO for Dummies guide, so we’ll be starting from the very scratch. So what are the basics which build up your SEO game? The founding pillars? Where do you start? Even though there are over 200 SEO factors that come into consideration, most of them are born, or effected directly from these three basic-factors. Therefore, these are the most-basic, active SEO elements that you can control from your end and which massively effect your website’s rank. Each of the above elements have quite a few sub-elements of their own which we will take a look on now. Backlinks have always been of utmost importance when it comes to SEO. There has been speculation of its importance dwindling over time, but it still remains arguably the most important factor determining your SEO. Backlink is simply a link, from another website linking to your website. For e.g. this here is an example of a backlink. So when the above link is clicked, you’ll be taken from this page to a Wikipedia page, and that means Wikipedia just got a backlink from us. Because, it’s like we are showing our “trust” in Wikipedia, by redirecting our users there. So, Google detects that and takes it into account. The more websites linking to your site = the more sites trust your site = the better it ranks. Internal backlinks are another type of backlinks important for your SEO. They are links pointing to not other websites, but to articles/pages within your own website. You should try to link to related articles on similar topics when you publish a new article on a topic on your website. Before moving on to the next section, another aspect you need to make yourself familiar is with “Anchor text”. It’s the “text” which is used to link to your site. For e.g. in the above example where I linked to Wikipedia, I used “this here is an example of a backlink” as the text which links to Wikipedia and that’s what’s called the Anchor text. It’s recommended that you use the keyword for which you want to rank as the Anchor text. For e.g. if you want to rank for “best shoes”, try to get as many links as possible using the anchor text “best shoes”. So now you know what backlinks are. But, how to build backlinks? It’s thin-ice and you need to tread carefully, because careless backlink building is considered spam by Google and you’ll be penalized. There are many ways to build backlinks, but I’ll limit myself to the most-basic ones considering this is a SEO for Dummies guide and not confuse you with the advanced strategies such as Web2.0s or PBNs. You’d notice most blogs have a “comment” section which let others leave comments about the blog and article there. So, collect a list of blogs in your niche and start doing commenting and always make sure your comment adds value to the article. Never put the keyword in the name field, it is the wrong approach. All your hard work has ruined if you put keyword in the name field. Another method to curate backlinks, more powerful than the comment links is guest posting. It’s simple, you find other sites related to your niche by typing in your topic/keyword on Google, and send them an E-mail saying you will give them a detailed, high-quality article, in return they should link to you. Not everyone will accept, but these links are very powerful so anything is better than nothing! These are extremely helpful in getting a lot of backlinks easily. Roundup posts are posts where you ask the experts on a topic a specific question and they answer it. All the answers are then published in a compiled article. For e.g. this here is a roundup post. You can mail a lot of people or connect to them on Facebook/Twitter and ask them to contribute to your round-up post. Most will, because it adds to their authority and they’ll get a backlink from you when you mention their name. How this helps you is, most people, when they get mentioned somewhere else, like to show it off to others as well by linking back to you so others can check the roundup post. Considering I’m covering the most basic methods to build backlinks in this SEO for Dummies guide, testimonials is yet another way to grab them. Although it’s not applicable everywhere, but when you purchase something or take a service from someone, you can give them a “testimonial”, your opinion on their services and ask them to put it up on their website which will help them get more customers. They will do so along with your name and link (you might have to ask for it) but it’ll still be a backlink. It’s actually an advanced link building method, using tools to find broken links and replace them with your own. But a simpler version of it is, whenever you’re on the web and you find an article which is related to your niche, and a link on the article is broken (doesn’t work, redirects to a very old post, isn’t relevant), you can e-mail the website owner using their contacts section and pitch your fresh(er) post. Use the “exact keyword” as anchor text for not more than 50% of your total links for that URL. (For e.g. If you’re building 100 links for “best shoes”, use “best shoes” only 30-50 times). Use “related keywords” atleast 30% (instead of “best shoes”, use “good shoes” “shoes for running” etc). Use generic anchor text around 30% of your total URL volume (generic means a keyword which is general and isn’t anything specific, for e.g. “click here”, “read more” etc). Although note that backlink is only “one” of the SEO factors, and even though it matters massively, it’s not the “only” thing that matters. So the other most important SEO element we’d cover in this SEO for Dummies guide is content! Content is technically the “text” that your website has. For e.g. this article is a piece of content for this website. It matters because, it’s this “content” that Google checks in order to determine what your site is about and to determine your ranks. Headline is the first thing that readers pay attention to, and not only human readers, even Google considers it a priority because headlines use a <h1> tag (it’s automatic so you don’t have to worry about it). Point is, Headlines are important so make sure the keyword you’re targeting is there in the headline. 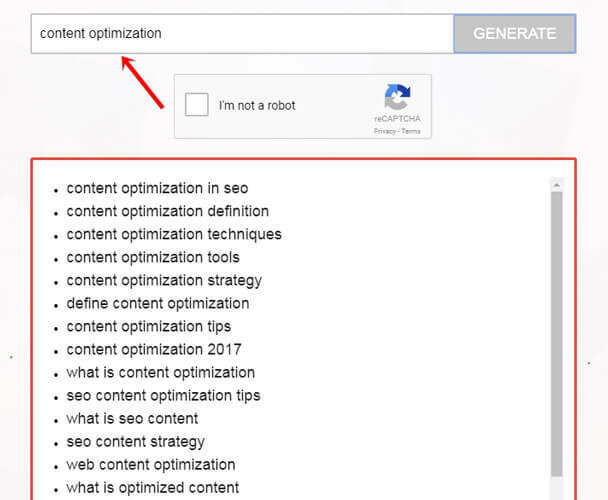 Make sure primary keyword is there in the first paragraph of your content. Make sure your keyword is there in the last paragraph of your website. Make sure that this primary keyword isn’t used more than 1% in the overall content (10/1000 words). Earlier, simply spamming your content with the primary keyword a 100 times used to get ranked. It doesn’t work anymore. Using the exact same keyword over and over again makes you look desperate, and hence effects negatively. So it’s advised that you find “related keywords” to your primary keyword, and use them instead. You can use LSIGraph.com to find related keywords and sprinkle them on your primary keyword. Using these instead of the primary keyword repeatedly keeps the content authentic, and still highly relevant to the primary keyword/topic. Content length extensively matters when it comes to SEO and is one of the most basic points we can cover in this SEO for Dummies guide. Longer content is prioritized over shorter content, period. Here’s a report from SerpI.Q backing up the statement. (Although there are some exceptions based on some metrics such as DA/ Quality of links etc. but that’s not to be covered in a basic SEO for Dummies guide). 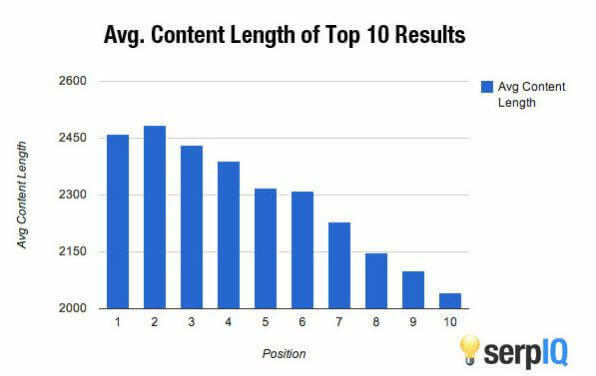 Make sure that each of your articles are longer than, or atleast equal to the average length of the top 3 results for your keyword. Meaning if the top 3 results for your keyword “best shoes” have an average content length of 500 words, make sure your content matches that length. Make sure your content has atleast 1 image, and the “alt-text” of the image should be your primary keyword. Publish frequently, and keep up the consistency. One of the biggest factors most SEO for Dummies guide forget to cover is consistency. It’s highly under-rated, but consistency does make a difference. Finally, the last basic element I’m taking up for this SEO for Dummies guide is Social Signals. Social signals have the same function as backlinks, but they aren’t links. They simply are the “shares” “tweets” and “likes” across various social media platforms for a website or a specific piece of content. Google partnered up with Twitter to display twitter links in search results, Google+ links are already famous for showing themselves up on the search page which is evidence of the importance and link between search engine and social media platforms. The more people like/share/spread a piece of content, Google believes it to be more and more authentic and worth ranking above others and hence it effects your SEO. Roundup Posts: As we mentioned in the earlier sections of this SEO for Dummies guide, when a group of people are invited to a roundup, and are mentioned as experts, they tend to share the article on their social media platforms. And, as they’re mostly experts with a fan/followers base, the article is further shared all adding to your social shares. Facebook groups are a major source of social shares. If your content is really worth it, and you’re in the right group, simply leave the URL along with a genuine, authentic caption. Chances are it might go viral. You can also ask people to share your articles personally, basically there are no rules or restrictions upon how you get it shared or liked on social media, what I’m trying to say in this last section of this SEO for Dummies guide is social signals matter, so get them. Now you know all SEO basics. To enhance your SEO skills, you can join SEO courses online. I will advise you before joining any online SEO course, ask at Forums & Social Media about them to ensure they are legit and offering good services. Let’s wrap this SEO for Dummies guide up, I accept it wasn’t very advanced, well that was the goal, to make it the “simplest SEO guide ever”. Note that Google doesn’t have any published article or guide detailing these ranking metrics, so nothing is fixed and SEO changes nearly every second. Although the above-listed factors have been consistent for over 2 decades now and hence are mention in this SEO for Dummies guide. The very bottomline is, make your content better then the best, the layout, theme, content everything should scream quality, as long as a user likes your content, search engines will too. Filed Under: seo tips Tagged With: search engine optimization for dummies, SEO Basics, seo for dummies, what is seo? Showbox Review: Is it legal and More Importantly Safe to Use?